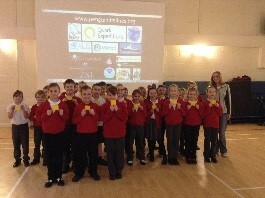 This term, children in Y6 have been enjoying our new Bananagrams club. The aim of the game is to spell as many words as possible, setting them out like a crossword, using up all of your tiles before your components. This has helped them to improve their understanding of spelling and spelling rules. We entered the Bananagrams competition, with Lucy Pick being named ‘The Best of the Bunch’. She is currently competing in the online rounds for the chance to compete in the national final in London. As a treat for achieving our prestigious ‘Gold Award’ for reading at home, children from across the school were invited to meet Sarah Hill, the author of the Whimsy Wood Series books, however, not in person but on Skype. In the session, the children were able to ask Sarah many questions about being an author, writing books and having them published, which she happily answered, sharing some of her funny stories. Then, she treated us to a short reading from one of her books, which the children thoroughly enjoyed listening to. On Thursday 2nd March, all of the children from Staniland Academy had fun taking part in World Book Day celebrations. The theme this year was ‘My favourite book character’, which was the inspiration for many children’s outfits this year- with many boys coming to school wearing a dress! Over the day there were competitions, which included a decorate a door competition- where our corridors were transformed into bookcases, with our doors depicting our favourite class stories. With thanks to our P.T.A. in each year group, a child won a £10 Waterstones voucher for being the best dressed- this was a very kind and generous donation. £1 donations were collected over the day and we managed to raise a total of £404 which will go towards our library project. Year 1 welcomed a variety of pets into their classrooms as a launch to their ‘Paw, Claws and Whiskers’ topic. Children were invited to bring in their favourite furry (or not so furry!) friends for the day to share with their class. Several guinea pigs joined us, along with a hamster, a rabbit, giant snails, Miss Duffy’s dog, a parrot and even come cats for a short part of the day. We learned about pet responsibilities and used lots of exciting adjectives to describe them too. It was a fantastic, memorable experience for all the children, and animals! Professor Poopenshtinken and his team from Magical Maths have recently finished a six week course of maths fun for some of our pupils. 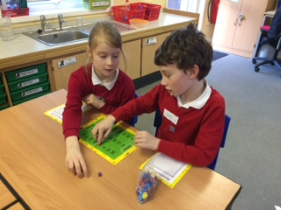 The children have had lots of fun completing maths challenges and fun activities using numbers. The professor was very sad to leave the school, but we are planning on inviting him back in September, for another round of Magical Maths fun and games! Ice Week was sooooo cool! We were kindly visited by Fiona the Penguinologist in Spring term 1. We had a great day, Fiona told us about her adventures in Antarctica. The children were so excited to meet a real scientist and had so many exciting and interesting questions for her. Our favourite question was; how do penguins have fun? We found out that penguin chicks can be very cheeky and often run after their grown up pecking their feet, when they are hungry! She is part of a conservation scheme, look on https://www.penguinwatch.org/ to find out more. At the athletics tournament Kieran and Milana were very strong at Javelin coming first and second. In the relay races, the Staniland team had a lot of 3rd places, although when Kieran and Luke did the relay race they came 1st. David pulled off an amazing jump to get second place. Shanice and Dija also won the 6 lap relay race. And finally, in the obstacle race Riley, Kaspars, Deimantas and Edvards came 1st. After struggling last year to enter a team for swimming, Staniland came back swimming strong. A good start to swimming front crawl achieving second and third places. Tyler Ruck and Nikita Healey also swam strong in back stroke against some tough competition. Then Mason Carr achieved first place in breast stroke. However, due to matters out of our control, we struggled with the relay races and unfortunately had children missing from two races. 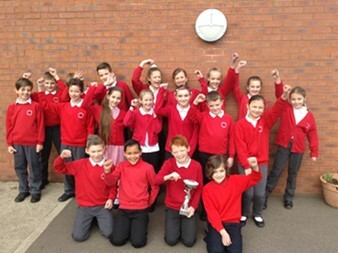 Staniland are very happy with their performance despite coming fourth place and achieved a score close to joint second place schools. We will be back next year! This term we have launched TT Rockstars. This is a website designed to support the children with their multiplication tables. All children have been assigned and username and password where they can create their own rock star, they can then challenge each other in rock contests to see who is the TT champion. Please encourage your child to complete some of these challenges at home.